Few artists are as universally known for a single work of art as Robert Smithson is for Spiral Jetty, 1970. Yet this art-historical hallmark wouldn’t have existed had Smithson not been commissioned to create a site-specific installation for the Dallas-Fort Worth Airport in 1966. With this project at hand, Smithson was inspired to imagine flying in airplanes as the primary vantage to see his proposed sculptural experiments, proving a key turning point in the artist’s conception of monumental works executed with and in the landscape. 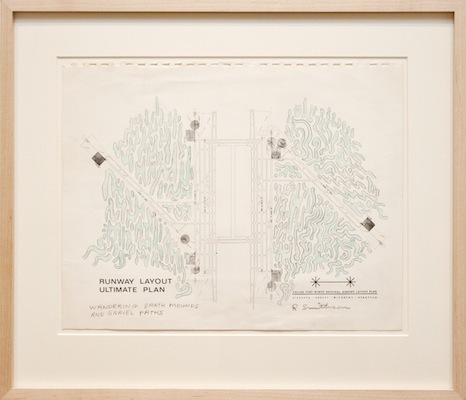 Except for the posthumously constructed Amarillo Ramp, 1973, this small exhibition pays homage to five of the artist’s unrealized artworks in various locales around Texas.